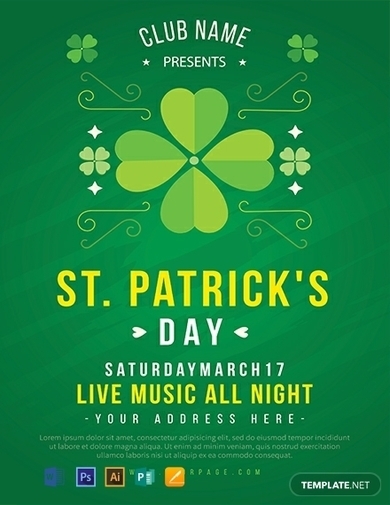 There are many exciting ways to celebrate St. Patrick’s Day with your friends and family. But to most businesses, making these festivities known to the general public can be a challenge due to the gradual rise in the competition. While there are various ways to execute your marketing strategies, a flyer templates are known to be one of the most cost-effective options to choose from. One way to help drive foot traffic to your store or restaurant during the holidays is to use an advertising flyer to promote whatever event you have planned for your consumer market. 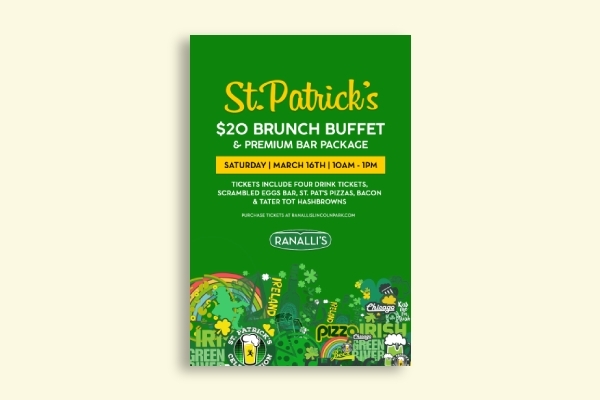 This St. Patrick’s Day Celebration flyer template is the perfect promotional material to start with thanks to its key marketing elements that allow you to get a message across to your target audience in style. Simply edit the existing components of the template to let it meet your personal preferences. With St. Patrick’s Day quickly approaching, you’re probably scrambling to find a good advertising medium to stand out from the competition. One way to save yourself from the stress and pressure of making something from scratch is to use a ready-made template to craft your event flyer. A simple flyer will help catch the attention of customers and persuade them to take immediate action. Feel free to use the template provided as a basis for your flyer design. After endless hours of dancing, cheering, and standing as you witness a sea of colorful costumes and extravagant floats dedicated to Ireland’s patron saint, it’s impossible not to end the parade with an empty stomach. Brunch buffets are pretty popular during the holiday, so being able to bring customers to your doorstep should be your first priority. The flyer above shows how you can do just that by using the flyer as a channel to communicate your offers to diners. 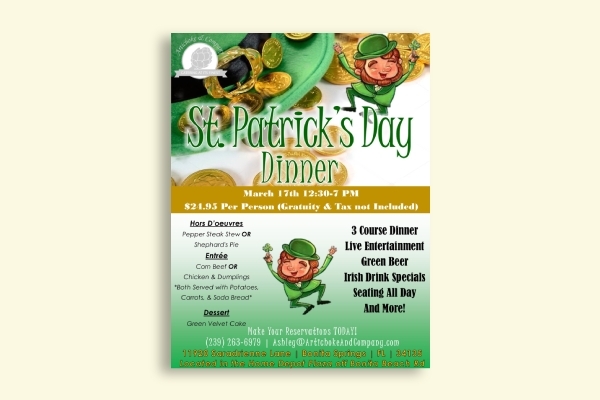 To make your buffet look more enticing, you may include a St. Patrick’s Day menu in your flyer so that the people can see what you have to offer. 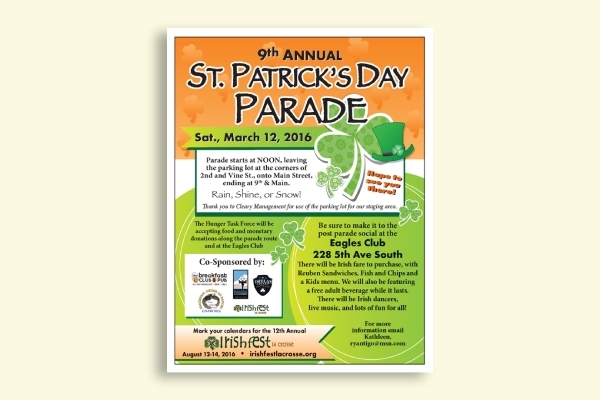 Widely celebrated holidays, such as St. Patrick’s Day, is always a good time to take advantage of. If you’re in the food business, limited offers and special discounts are sure to attract customers without a second thought. The competition can get pretty tight during the holiday season, so raising awareness is a game you wouldn’t want to lose. 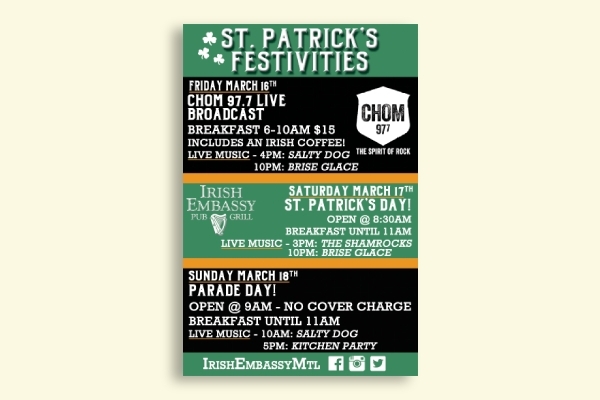 Consider this as an opportunity to exhibit your creativity and marketing skills by investing in a St. Patrick’s Day flyer. This should be enough to entice viewers to come in and try out whatever you have to offer. To many individuals, St. Patrick’s Day is just another excuse to party hard and drink without a care in the world. A lot of clubs and bars around the city host dance parties in an attempt to draw customers to their business. 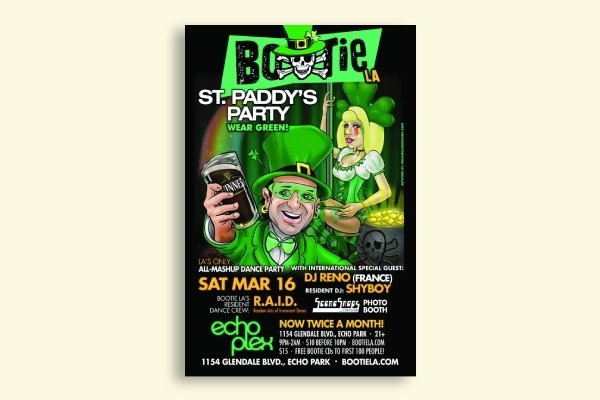 A party flyer is often distributed to advertise the event and create awareness among those interested. Shown above is the perfect example of an eye-catching flyer design that will get people talking. This offers a glimpse of what viewers can expect from your party along with a few details that they can refer to if they decide to go. 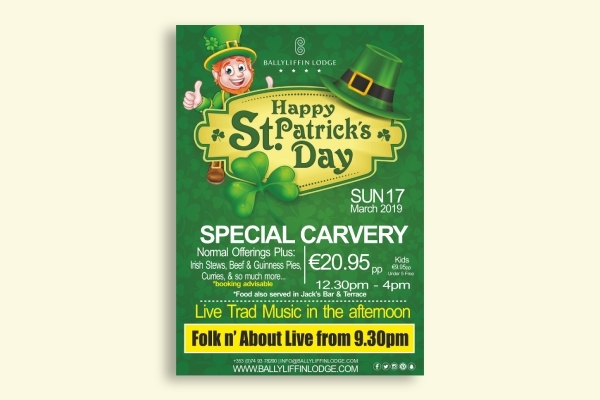 In some communities, St. Patrick’s Day can be a week-long celebration to commemorate the man known as the “Apostle of Ireland.” These festivities are typically announced weeks before the actual dates in order to keep the public fully informed. Flyers are often distributed around town to help spread the word about these events in the most efficient way possible. Participants are likely to find details about the event in the flyer, including the what, when, and where of each activity. 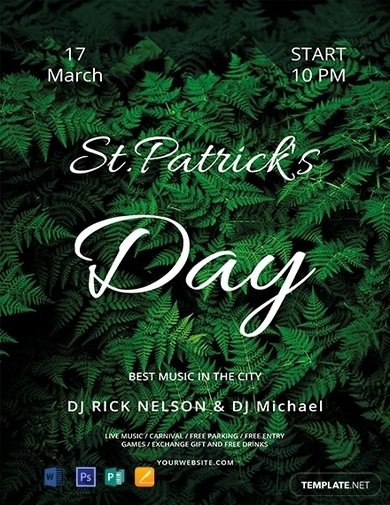 In addition to those already mentioned, music flyers are likely to circle around the community in honor of St. Patrick’s Day. Customers are in for a treat as they witness live traditional music being played while enjoying the food being served at the venue. The great thing about using a flyer to promote the event is how there’s enough space to include a sufficient amount of information that customers might need to know about. By doing so, you have better chances of generating a good turnout for the upcoming festivities. The St. Patrick’s Day Parade is a spot for tourists and locals who want to experience the true essence of the holiday in its purest form. This often gathers ten times the number of people who attend the festivities scheduled on the same day. Because of this, providing the proper guidelines for participants to refer to is extremely important. You can do so by handing out stacks of flyers a few days before the parade. It’s an easy way to deliver the information necessary to organize a smooth and sound event for the safety and security of attendees. While St. Patrick’s Day may not be a season of celebration for athletes and sports enthusiasts, it’s still an opportunity for sports bars around the world to give customers a reason to order a beer or two. Ireland is said to be the sixth country in the world to have the biggest beer drinkers, which comes as a challenge to beer drinkers from different continents. 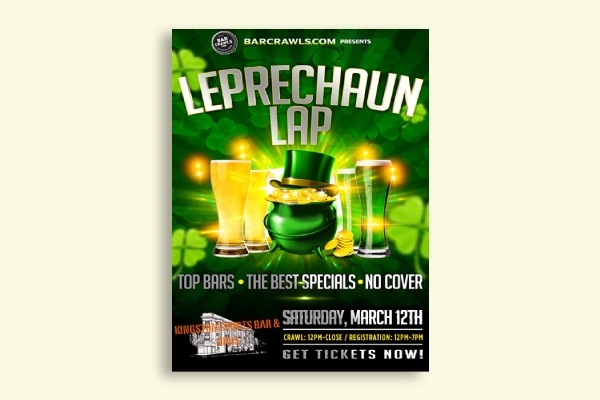 Even if the area you live in doesn’t pay much attention to St. Patrick’s Day, you might have a couple of customers who might be interested to take part in the festivities. Seen here is an example of a promotional flyer that you can use to engage prospects and sell tickets to your event. There’s nothing like hosting a street party to boost awareness, gather a crowd, and make a sale. However, you won’t be able to do business without drawing customers to your event in the first place. 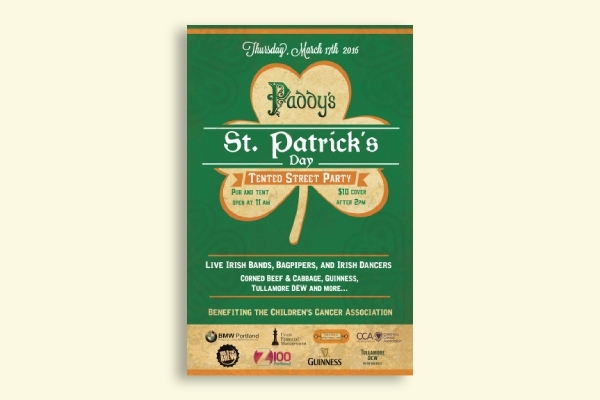 Shown above is an example of a fundraiser flyer used to attract sponsors and supporters to an upcoming event for St. Patrick’s Day. Designing a flyer that can grab the attention of passersby is crucial to getting your message across. Not only is it easy on the eyes, but the flyer communicates the objective of the advertisement as well.